I was backtracking a bit. But it was worth it. Two busses, a taxi and several hours later we were back near the Panama border on the Caribbean coast. Puerto Viejo, Costa Rica. It’s a kind of a surfie dude sort of seaside village. It’s the casual laid back feel that gives this popular seaside place an enticing feel. The palm tree lined beach front that sets the scene for enjoying a beer on the balmy warm evenings. A place as if there’s no rules. Just a loose understanding of the way things work. Like the main street that weaves it’s way along the beach front from one end of town to the other. Where the vehicles respectfully navigate around the locals, surfies and tourists casually flip flopping their way around town. With the occasional cyclist dawdling along on their rusty old treddlies. Some with surfboards strapped to the side, others just doing their daily thing. 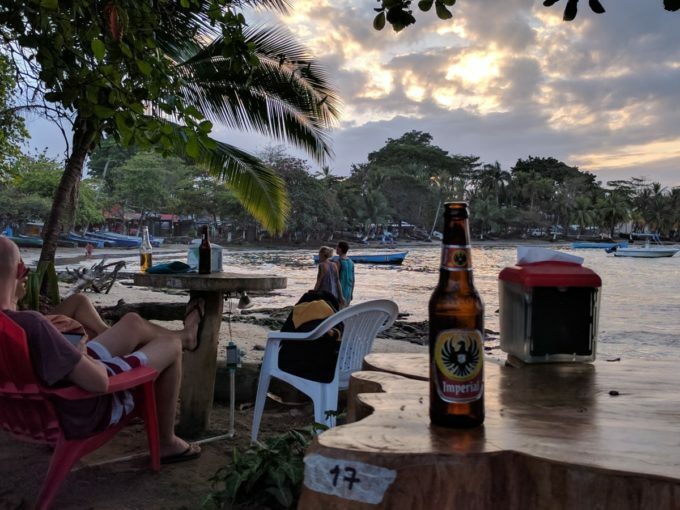 One of the things that seems to define Puerto Viejo are the many bars, cafes and restaurants. They each have their own unique character. Typically that beachy, rustic feel. But there was one standout to me. Perhaps it was the quirky character of the place that appealed to me. It looked like the joint had been put together over several decades from left overs from numerous garage sales. Then one day randomly doused in different colours of paint. But there’s one other thing I will remember Puerto Viejo for. My son had been trying to get me to do this with him for years. But now I felt the stars were finally aligned… no sharks, warm water. 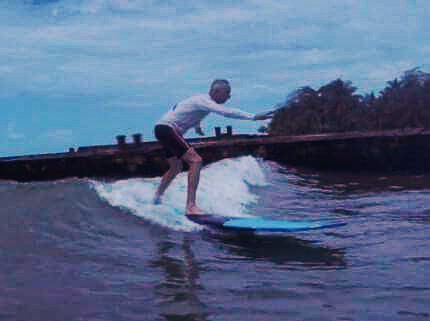 Like hey dude, I had my first go at surfing…. !